Chat shorthand for this blog: BBHGB. "Bonnie brings home good books." I say that often. The latest is The Great Cake Mystery: Precious Ramotswe's Very First Case by Alexander McCall Smith with illustrations by Iain McIntosh. McCall Smith has written a No. 1 Ladies' Detective Agency book for young readers. I see that the Downers Grove Public Library copy identifies it as 3rd-4th grade reading. I liked it, too. To be specific, it is a pre-No. 1 Ladies' Detective Agency book as it tells the story of the first mystery that Precious Ramotswe solved as a school girl in Botswana. I hope more are to come. I learned more about the sleuth and her revered father Obed Ramotswe, who tells a wonderful story early in the book. Teachers will like The Great Cake Mystery, too, as it has discussion questions, a short glossary of geographical terms, and curriculum suggestions in the back. It would be fun if someone would write young Miss Marple or young Poirot mysteries. There are young Sherlock books. McCall Smith, Alexander. 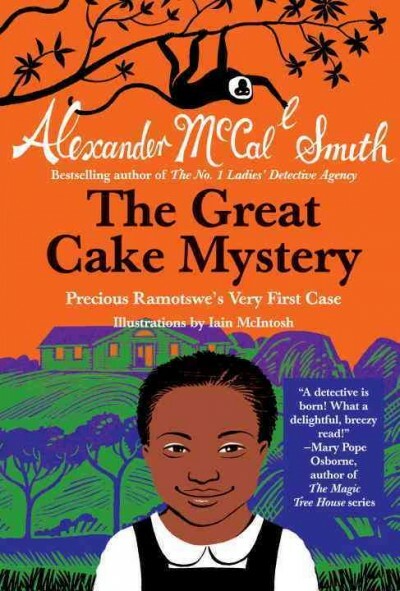 The Great Cake Mystery: Precious Ramotswe's Very First Case. Anchor Books, 2012. 73p. ISBN 9780307949448.